I use Lobster regularly they make hiring a car so easy. I would have no hesitation recommending them. I use Lobster very regularly has they make hiring a van so easy. Very reliable and friendly. I would have no hesitation recommending them. As a Mobile Bar company we use vans on a regular basis and Lobster are the only company we go to. Their vans are excellent always clean and very reliable. The customer service is faultless and very friendly. I would and have recommended them above any other company. Keep up there great work Guys! I recently moved from Hockley Essex to Preston Nr Canterbury hiring a Lobster Luton Van. I have hired vehicles in the past from National organisations, but I have never been so pleased with the level of customer service and flexibility provided by the Lobster Canterbury team. I will be hiring vehicles from them again, recommending them to my friends and to you. good efficient service, friendly and helpful. Van ran extremely well. good efficient service and nice staff, friendly and helpful. Van was clean and ran extremely well. Would recommend this company as well run with good competitive prices and selection of vans. Very reasonable prices which is why we picked them. Efficient, friendly service. Good helpful service on short notice. Good, clean van. Would definately use Lobster Van Hire again and recommend to others. I can't recommend this company highly enough. Really helpful, friendly and just very nice people. Good prices and great vans too. Local service at its best. I hired a van from Lobster to move stuff from Kent to Devon, the van was very Reliable and drove like a expensive car it was so smooth. I would recommend this company to anybody. 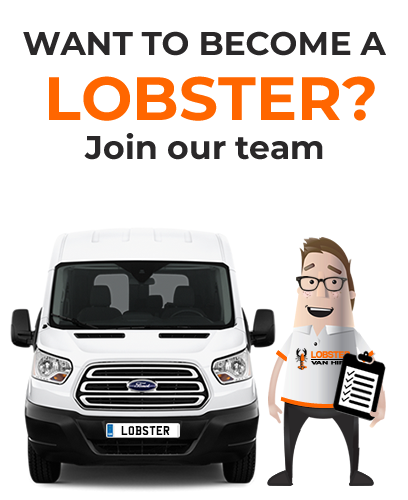 If you need a van and want to sort it with no worries and helpful staff then Lobster do that. I have no reason to not use them again. Very helpful and accommodating. Excellent and efficient service. Will definitely recommend and use again. Great company, great service, very polite staff,clean and tidy vehicles and all at a cheap price. friendly and professional customer service, always fantastic services , reliable and economical vans. no other van hire service can beat there already cheap hire prices and its always pleasure to do business with them. i will definitely recommend any one to use lobster van hire services. vans are in good condition, a good price and the staff are friendly. Nice van, clean, comfortable and done the job. Great van, service and price. Will be using them again. Fantastic service from Lobster van hire, easy and efficient. I will defiantly be recommending my friends and family for when they need a van.